Art In Stitches: This piece needs a title ,,, please help! Weaving heirlooms for the future/weaving future heirlooms. I've been going round inn circles trying to come to a decision thinking about cradles and nurturing but I think 'Bedtime Stories' says a lot about what's going on. Your beautiful spools have stories of their own in the labels that still attach to them and the more you look at them the more you see in them. 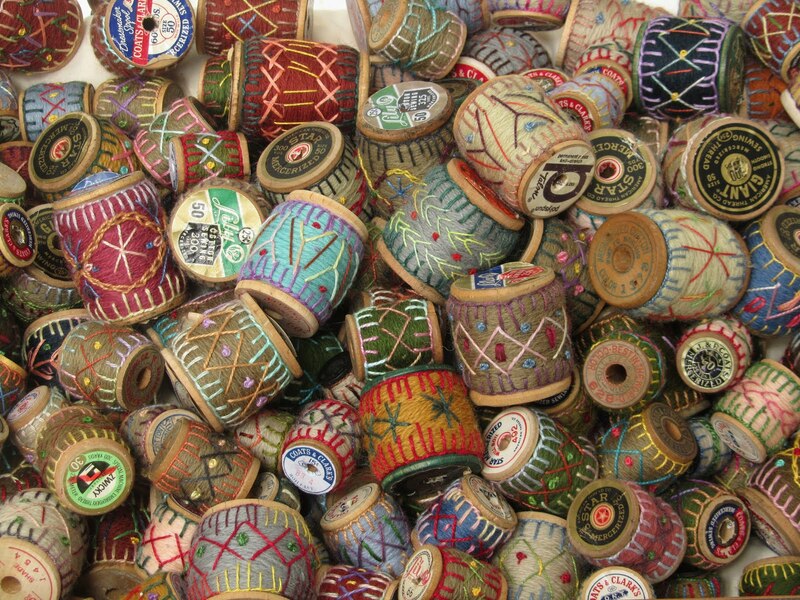 Not wishing to muddy the waters, their shape and decoration reminds me of native drums and their decoration. I vote for "Bedtime Stories" - simple but with all the meaning you have spoken of. I think you have hit the nail on the head with 'Bedtime Stories', because of the implied story in each and every spool, and the fact that thread/yarn/tangled threads evoke the idea of stories. What a wonderful installation! I love it whatever you call it. 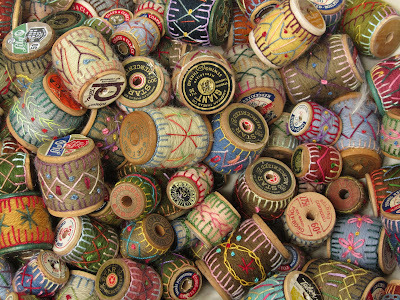 I have a few wold wooden spools of thread that were my grandmothers. I never would have thought of what you did with them. Just wonderful. The spool images have such delicious textures and colors!! Slippery Rock?Pa?? ?You were close to me and I didn't know it!Next time let me know! I love this piece and I have to think on it but will be back with my title!Beautiful! 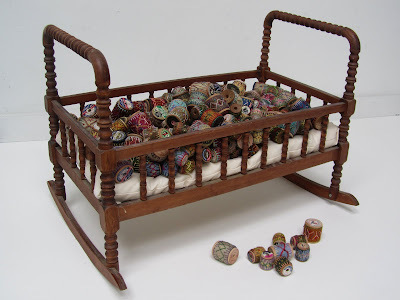 My first thought at seeing it was "Cradle of the Ages"... the antique cradle, the old spools... the stitching... It's a lovely piece. How about Threads Of Childhood? Oatmeal Kisses! Google the name. It is a poem. You will see why. It's beautiful just like your work. How about Bundles of Joy or the Golden Cords. How about "Storybook Cradle, a place where dreams are born"
When I saw your piece "Spindles and Spools" popped into my head. It stuck! Stitches in time for a family of remembrance. I think Bedtime Stories is perfect! 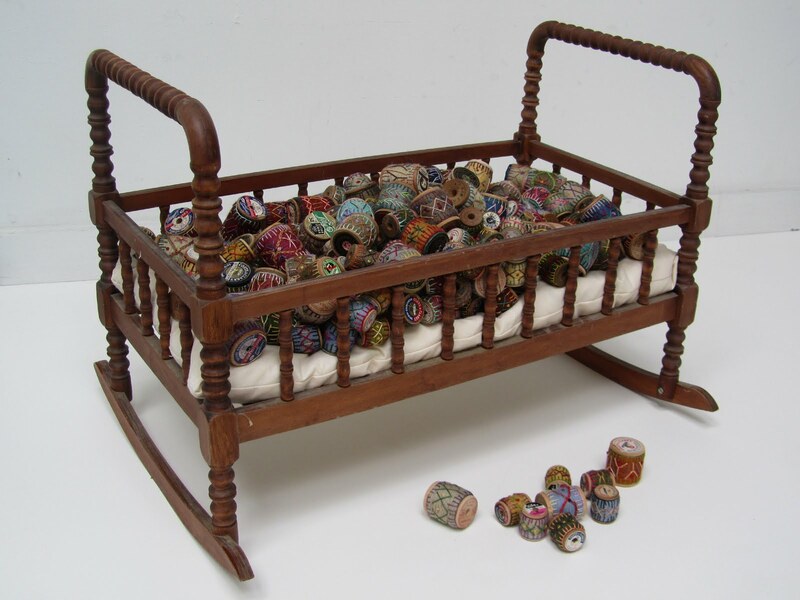 Each one of those spools is a story in itself, and having them in an child's cradle suggests to me that this child is going to grow up happy and secure hearing all the stories about family. I don't have a title, but just wanted to say I have that exact cradle! My family brought it with them when they immigrated here from Germany in the 1700's. My Mother had it restored and gave it to me when I was expecting my one and only child. With my daughter, that made 6 generations and over 50 babies that slept in that cradle. It still has all the little teeth marks from where the babies teethed on the wood. Can I ask you what you paid for the cradle. I've never had mine appraised. It's a lovely installation. I love the detailing and the palette. How do you think about,:Tale spun by soul's thread" :) Good luck! I agree with Julie, I also find the spools symbolically native somehow. Be that aboriginal, american indian, south american or the shaman spiritual.........its a hand drum symbol that can cross all cultures for differiung reasons. yet it speaks of human contact and endeavor in more ways than the stitches. Love the piece, its very touching. bedtime stories is my favorite title.. Thank you to EVERYONE here and on Facebook. I have a long list of lovely, potential titles. I'm still mulling it over but will write a blog post when the decision has been made. Many of the titles suggest "new work". It has been so interesting to read how a single work resonates differently with others. Fascinating and I am humbled by the willingness so many had by suggesting a title. Thank you! Love the spools. Is there a "how to" on how to make what is on them. I find these stitched spools fascinating. And like others have mentioned, my first impression was also of native drums. But when I clicked to enlarge the photos, I was reminded of the needlework samplers that young girls once stitched so long ago. As for a potential title ... "Tell Me a Story" or "Sweet Dreams"? 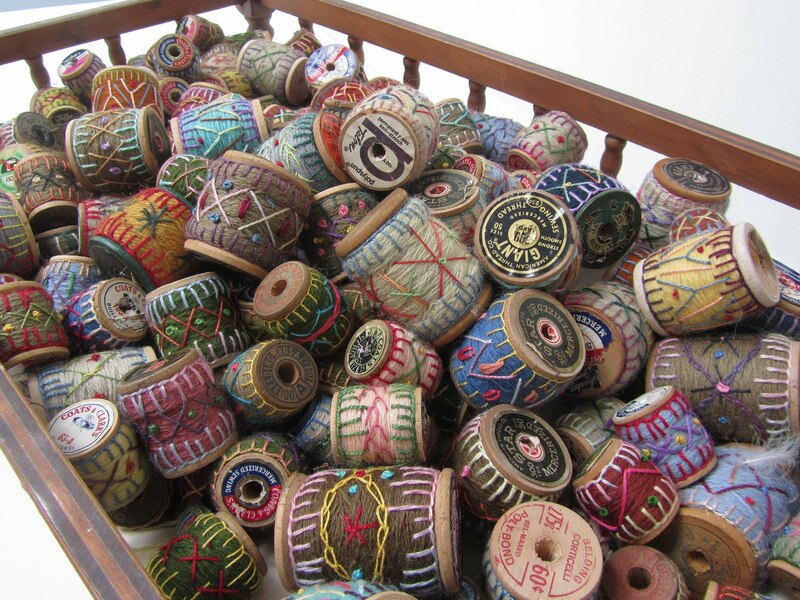 Susan, I love your spools! What a wonderful way to use them. Do you---or will you have a tutorial on making them? 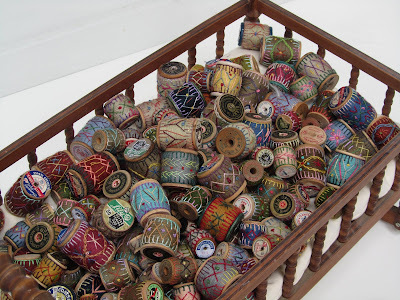 I have a collection of old wooden spools and would love to do something like this with them. 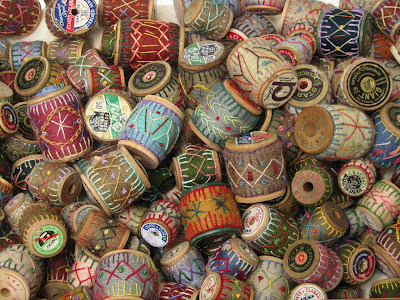 Spools of Love. great ideas! I am impressed how many people responded!! Once upon a spool there was a story. Not too late, I hope? This one is my favorite since your Spool Designs definitely "rock" in more ways than one! Ü Each spool design tells a story and consists of "Threads that Talk." maybe "The Cradle of Creativity" "The Cradle of Imagination"
Second thought, I love old wood spool and you should try to make a spool stand for lamp.. Something you can save old wood spool for additional lamp or some kind of idea? I love the idea you did put felt fabric and sewing it. Great Craft idea. Bedtime Tales or Stories...love the piece and were you on your way to Slippery Rock PA? I live right by there! Small treasures! And, but do I wish I knew how you made these beauties. Love your work. bedtime stories is the first one i really liked. then someone suggested sweet dreams, which i also think suits it well. and the one that popped into my head is dreamtime. I love the look of these. They remind me of the ancient Incan quipus - the knotted strings used to tell stories or send messages. Something about the story being told by the various knots and stitches. google Joseph Cornell. These would make a great specimin box, "assemblage." 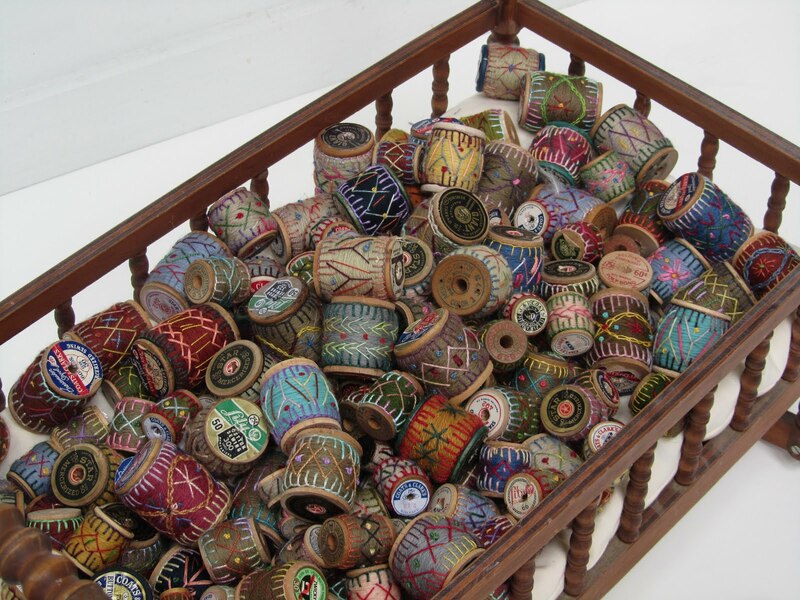 I used wooden spools as Prayer wheels in a themed assemblage box, printing words on them that represented spirituality of the person the box was for/and about. Then in the box I put them on spindles so you can spin them. I'll post a picture on pinterest, but I don't know how you'd ever find it. So you'll have to use your imagination to know what it looks like! unknown would be me, juliecorkzim@gmail.com. Not sure how to tell you to find me on Pinterest. I love these! Just like lots of others who have commented I have some spools and you are now my inspiration! I would have to choose THREADS OF LIFE, I also collect dollies, and anything that is had sewn or embroidered, and I always think of the women who made them, wondering what their life was like and wishing we had the simply life they had, well maybe simple is the wrong word, but they took the time for the things they loved to do with their hands! Love these! Just found this lovely article, Probably too late but what about "Thread Lightly (for you thread on my dreams)"? Wonderful use of found/made items. I like Bedtime Stories. My suggestion is "Cradling Inspiration". My husband's family had a similar cradle - German heritage - that was passed on to the next grandchild after ours. 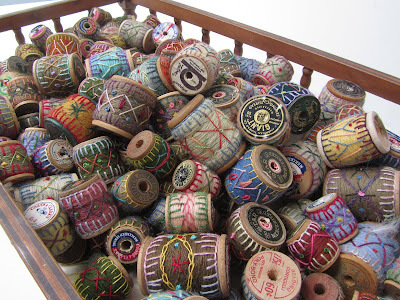 A suggestion for your extra spools -- turn those beautiful little works of art into unique lamp/fan pulls or pendants. I've started doing that with wine corks, using beads instead thread. du tout grand art! great art, art , oh si joli! ..I am flabegasted by such a work creation ,so lovelly. 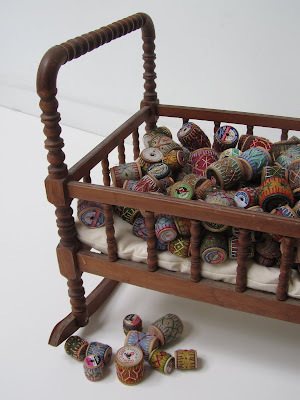 I see Sampler Babies and I too will be using this idea for my leftover spools and scraps of canvas and fabric! I'm already doing "patches" with fabric scraps. Spools of Fun Times would be my choice really like this idea I have lots of wooden spools. I have seen them made into wreaths and necklaces. Mostly painted but I like the stitches idea. Might just have to pull out my stash of goodies and see what I can come up with. Forgotten Memories. Long-forgotten memories kept safe in the cradle. Just a few Ideas for your Title. I love the evocative nature of this piece...reminds me of all the women who have gone before us. Lovely work! Cradled stories and dreams of spools. In the industrial north of England we have a saying "what a load of bobbins" when something isn't right. CONCEPT: now, how to condense it into a title!! I was thinking ....... we are born with a full spool of thread and and at the end of the cycle the spool has unwound and the wooden skeleton remains. Here lies the memories of those who went before. As the spool unwinds the thread, the thread weaves through projects we create, goals we achieved, decisions made, recording moments and events that are brief but precious. We have just one spool each. What will you create with yours?